The Tech Works CI-MSI-22 Microphone Speaker Interface is part of the Collaborative Intercom product group. Designed to take a variety of Audio Intercommunication products and let them talk to each other over the Tech Works CI-Buss. 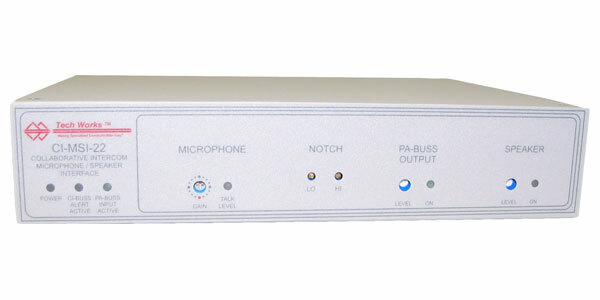 The MSI-41 consists of five Functional Modules; Two Inputs; The local Microphone/Line Input and the PA-BUSS Input, Two Outputs; a 25 Volt Speaker Output and the PA-BUSS Output, and the CI-BUSS Interface. The Jumper Options determine how these Modules interact and function with each other. The “Standard Configuration” is a Remote (Single Location) for use with an Operator Console. The Power Amplifier, is used for a Procedure Room Speaker while the Microphone Input is used for a boom mounted or hanging Procedure Room Microphone. The PA-OUT, is used as Procedure Room Monitor Output, perhaps for Background Music. The PA-IN, may be used for an additional Microphone. The CI-BUSS may be used with other Interfaces, such as a CI-HSI-41. Initial setup is accomplished with built in level indicator lights and the controls. Once completed, no further adjustments should be required. Integral ALC, Variable Notch Filters, and Speaker Ducking allow for full duplex conversations without feedback. The CI-MSI-22 can be used in a small Intercom when connected to a single CI-Buss product or as an addition to larger systems using Headsets, and a variety of CI-Buss and PA- Buss devices. The Intercom simply plug together using standard CAT-6 patch cables. When connected to another CI-Buss unit all headsets, speakers and microphones become part of that system. The CI-MSI-22 provides a level of flexibility and control unmatched in communication.